There are versions of the Juice Pack Access for each of the 2018 models. As these devices offer a range of sizes, each version of Mophie’s accessory has the same general design but a different battery capacity. We did our testing on the iPhone XS Max version. No matter which device it’s designed for, Mophe’s latest consists of a hard plastic case that wraps around the back and sides of the handset, helping cushion it during drops or blows. There are raised corners that protect the display when the device and case are lying flat. The bottom edge of the Juice Pack Access is open, allowing you to access the Lightning port. This is a must-have for people who want to use wired headphones, or connect their iPhone to a PC. It’s a feature that separates the new “Access” version from previous Juice Pack models which charged the handset through the Lightning port and therefore covered it up. The Mophie Juice Pack leaves the iPhone Lightning port exposed. Covers over the side and volume buttons don’t interfere with their use in any way. Openings in the case for the camera bump and mute switch fit exactly. The speakers are also open to the air. The Mophie’s designers split this hard case into two segments, making inserting or removing the handset a snap. Pop the segments part, slide the iPhone in or out, then reattach the halves. This product is available in four color options: black, tan, blue and red. There’s simply no way to get around it: additional battery capacity requires adding bulk. 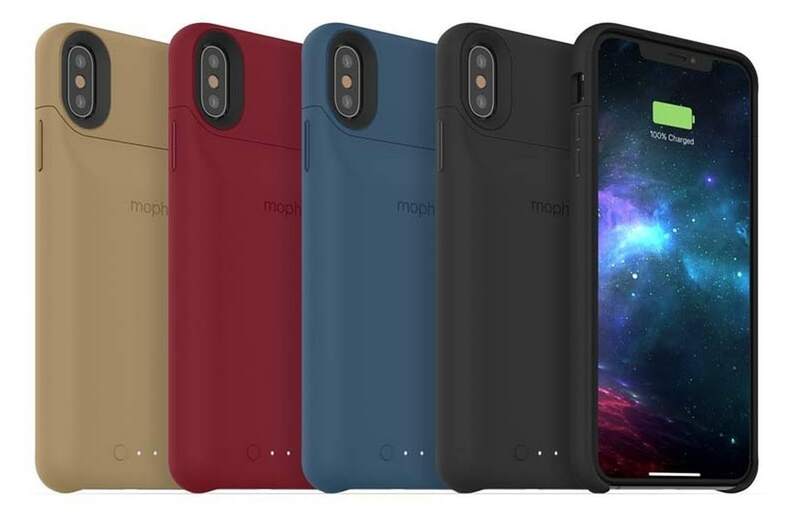 Rounded corners and sleek curves enable the Mophie Juice Pack Access to handle its weight fairly gracefully, and the battery is arranged in the hardcase so that it rides comfortably in the hand. But there’s no doubt this battery pack makes the already large iPhone XS Max even heftier. It weights in at 0.24 pounds, so combining it with the handset brings the total to 0.73 pounds. This version of the Juice Pack Access is 6.3 inches by 3.2 in. by 0.7 in. That makes it just slightly taller, a bit wider, but much, much thicker: more than double the thickness of the iPhone XS Max alone. The Mophie Juice Pack Access protects while it charges the iPhone XS Max. The designers of this battery pack went all-in on wireless charging. Not only does it charge the iPhone that way, the Juice Pack Access itself can be wirelessly charged. That’s not your only option though, as there’s also a USB-C port on the case. At the heart of this accessory is a 2200mAh battery, more than two-thirds of the size of the iPhone XS Max’s internal 3174mAH one. However, Mophie’s offering can’t give the handset a 69 percent boost. Wireless charging is very inefficient. In our tests, the Juice Pack Access was able to give our iPhone a 35 percent charge. The hard case transmits power at 5W, so it takes about 20 minutes to give our test handset a 10 percent charge. That said, this speed generally doesn’t matter because phone and charger are one — you’re not often going to be waiting around for the iPhone to charge. A button on the back of the Juice Pack Access controls whether it’s transmitting power. Next to this are four white LEDs that give a basic indication of the amount remaining in the battery. As discussed, Mophie’s offering can receive power from a Qi wireless charger, the same type that the iPhone supports. We tested it on several chargers without issue. It can actually receive more quickly than it transmits: 7.5W. Wireless charging for the case is often convenient, but using the built-in USB-C charger is much faster. We were able to fully charge the Juice Pack Access in just under 2 hours this way. Whenever this case is charging — through a cable or wirelessly — it’s also ready to power the iPhone. Mophie calls this Priority+ charging: the handset gets power before the battery pack. But the accessory can take in energy more quickly than its sends it, so its battery does get recharged, albeit slowly. We don’t have Apple’s recently-released battery pack for the latest iPhone models to do a hands-on comparison, but we can contrast the most important specifications. We’re limiting this to the iPhone XS Max versions to prevent confusion. Here’s the most critical comparison: the Smart Battery Case has a 1,369mAh battery, compared to the 2200mAh one in Mophie’s offering. Update: The mAh comparison stated above is true, but it doesn’t take into account the higher voltage of Apple’s product. As a result, the Smart Battery Case is rated at 10.1Wh, while Mophie’s is just 8.36Wh. Our apologies for the mixup. Almost as important a comparison is price. Apple asks $129 for its product while Mophie charges $29 less. In other ways they are very similar. The two cases weight approximately the same, and are roughly the same size. Both offer wireless charging for input and output, though Apple’s can apparently charge a bit faster. Each of these cases leave the iPhone’s Lightning port open for use. Apple chose a Lightning connector for wired charging, while Mophie went for USB-C. One allows the hard case to be powered up with the same cable as the iPhone, the other can be charged with a MacBook or iPad Pro cable. It’s perhaps a small thing, but Apple’s offering is available only in black and white, while Mophie offers black plus more options. Update (March 20): Apple has introduced a new colors for its battery case: pink sand. In summary, the Smart Battery Case holds roughly 20 percent more power while costing about 30 percent more than the Juice Pack Access. Plus there’s the differences in ports and color options. It’s up to the buyer to decide which is more important, naturally. The iPhone XS, XS Max, and XR all last a long time on a single charge, but adding a battery pack extends that even farther. And the Juice Pack Access is designed to protect the iPhone as well as power it. Having access to the Lightning port is convenient, and so is the ability to wirelessly charge this accessory. The USB-C port means you can leave the iPhone charger at home if you also travel with a MacBook. Just use the laptop’s charger and cable to power up the Juice Pack Access. The downside of any external battery pack is bulk. This accessory comes close to doubling the size of the handset, while only increasing its time between recharges by 35 percent. Mophie’s price for the Juice Pack Access is $99.95. That’s not bad considering Apple’s similar product is $29 more. Zagg/Mophie provided Cult of Mac with a review unit for this article. See our reviews policy, and check out more stuff we recommend.